iderdider....: big girl in a little coat. A pregnant friend emailed to ask for my baby shopping advice. I suggested a swing, because both of my kids were swingers. I suggested a mei tai because: pretty. And I suggested an ergo because wearing an 18 lb. little Mister requires lumbar support. I also advised against buying a bunch of clothes because they don't stay tiny for very long and people will buy your baby clothes. Also there are hand-me-downs and thrift stores. Buy something pretty for yourself and let the Grandmas dress your babe. But, as I was thinking about Angelina and her bean this morning, I realized that there is one exception to this rule: the coat. Every little kid should have a great coat. Your kid will wear it every day for most of the year. Plus, you can throw the coat over that dumptruck shirt she insists on wearing everyday and, wow, still cute. I especially love coats that look like something I would wear, only miniature. 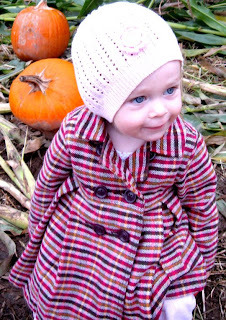 Claire's tiny pink peacoat has seen us through trips to the pumpkin patch and tulip fields for two seasons. It is time for the girlie and the coat to part ways. Ang, if that bean in your belly is a girl, I'll send the coat your way with our love. I always loved that coat on Claire. Too cute! Once again, thanks for the advice Kari. And yes. If Bean turns out to be a girl - two more months until we find out - we would love for Claire's coat to live on in Denver. and if angelina's baby is not a girl, can I put dibs on the coat for my future baby girl, that I may or may not have? hee hee hee, I love that coat. Really there are few things as cute as little girls in fancy coats...except maybe a boy in a vest!